If you're like most restaurant owners or managers who provide customers with seasonal patio seating, you undoubtedly feel a pang of sadness when the time comes to fold up those outdoor tables and chairs and close the door to the patio seating area until spring. You'll definitely see a reduction in the daily take when you clear your registers at the end of the evening shift, and you may even find yourself having to decrease your staff due to loosing a popular seating area. However, the right patio heater can help you keep your patio open to guests, your employees occupied, and your register singing. There's something about fire that makes even the dullest occasions take on a magic tone. The Ambiance Heater brings the mesmerizing beauty of fire to the table without the logistical drawbacks. Its controlled gas flame burns bright and clean, with no need to feed it with wood or fuel, and the built in safety features ensure the optimal safety of all guests and employees. The unobtrusive contemporary design of the Ambiance Heater lets the seductive flame be the star of the show. This heater is also an excellent option for guests who wish to book a romantic dinner in an unusual venue -- what could be more cozy and romantic than wining and dining by the light of a warm flame against a bright starlit backdrop or when there's snow on the ground or even falling from the sky? The Infratech Heater provides an ideal heating solution for when you want your outdoor heat source to be felt and not seen or heard. You'll get radiant heat, maximum energy efficiency, and a low, barely-there profile that won't interfere with the aesthetics of the space. 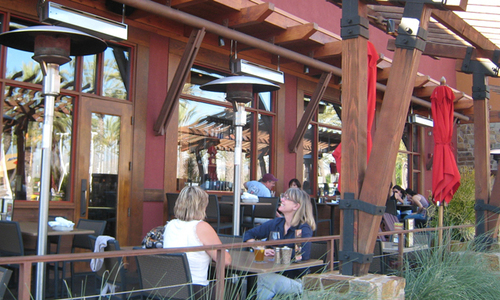 Infrared products come in a variety of models to suit the individualized needs of outdoor spaces found in restaurants, pubs, resorts, hotels, and other hospitality industry food and beverage businesses. AEI's long standing reputation as a leader in outdoor heating solutions began with the Sunglo Heater back in 1967. With four basic models to choose from, you can select the source that works best for your individual needs. For instance, if your patio space is small, you can choose a suspended heater that hangs from the ceiling to maximize valuable floor space. If you're heating an uncovered outdoor space, you can opt for a Sunglo system that fits on a permanent post mount and comes manual, sem-manual, and fully automatic ignition choices. Please feel free to contact us at your convenience to learn more about how our outdoor heating solutions can help make your hospitality business thrive.